For hard to treat skin pigmentation and Melasma. properties. Also disinfects drinking water. Silver ions kill micro-organisms by blocking their respiratory enzyme system. These microorganisms suffocate, die within minutes and do not get a chance to mutate or develop resistant strains. FIGHT SWINE FLU, H1N1 VIRUS, ANTHRAX, BIRD FLU, SARS, EBOLA & INFLUENZA. COLLOIDAL COLLOIDAL SILVER WILL HELP SAVE LIVES OF PEOPLE HAVING ANY VIRAL / RESPIRATORY, BACTERIAL / FUNGAL INFECTIONS & SIMULTANEOUSLY BOOST IMMUNITY. COLLOIDAL SILVER ALSO HELPS FIGHT NECROTIZING FASCIITIS (FLESH EATING BACTERIA) AND REDUCE MORTALITY. Prepare Colloidal Silver Solution within minutes, in your own home. Totally Safe and Natural with many Side Benefits. For Oral / Sub Lingual and Topical use. Excellent for Colds, Sore Throat, Flu, other Infections and Skin Burns. Disinfects drinking water. A must for your Family First Aid Kit. * Tested in UCLA School of Medicine against 650 known Pathogens, Micro-organisms, Bacteria, Fungi (including Candida Albicans and Candida Glabrata), Protozoa and Viruses. 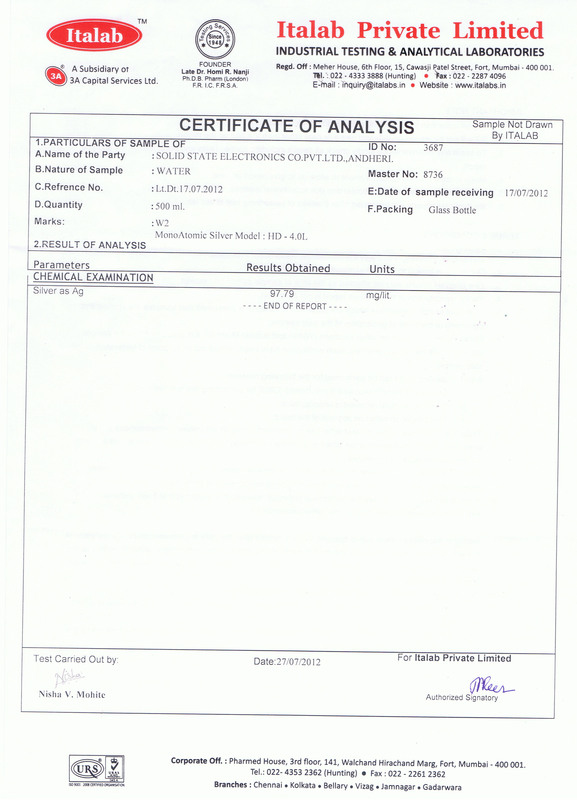 Test Report showing "No Growth" of Gram Postive and Gram Negative Bacteria and Fungus (Candida) from an independant Laboratory using our Mono Atomic Silver Generator. Download file in pdf format..
Test Report showing "No Growth" of HIV-1 Virus from an independant Laboratory using our Mono Atomic Silver Generator. Download file in pdf format. Mode of Action of Silver Nanoparticles against HIV-1. With the push of a button, you can set the unit to power off automatically after two minutes. Prevents damage to the electrodes in the event the two electrodes come into contact with each other or with any other metallic surface. 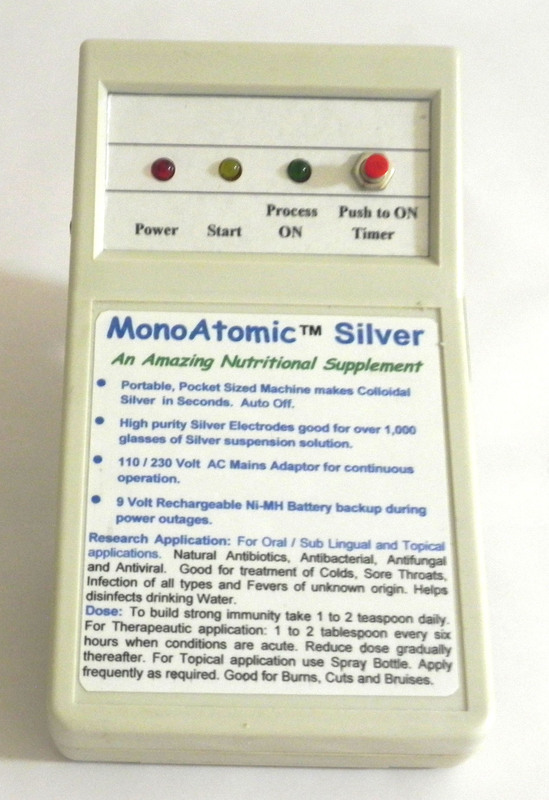 The MonoAtomic Silver machine may be powered by either the included AC Adapter (110 to 250 Volts AC) or a 9 Volt battery. · Prevents you from having to buy expensive replacement 9 Volt batteries. · Plugs directly into a 110 Volt and 230 Volt AC wall outlet. · Colloidal Silver is extremely light sensitive and will spoil in light. Use topically on cuts, wounds, abrasions, rashes, razor nicks, poison oak & ivy. · Professionally designed / robust consructions. · Will last the average person over five years! Used to clean the probes and keep them free of dirt and sediments. All of our kits come with an user friendly instruction manual, a booklet by Zane Baranowski and a pamphlet on Colloidal Silver. · Professionally designed / Robust Construction. · High Purity Medical 99.99% Medical Grade Silver. 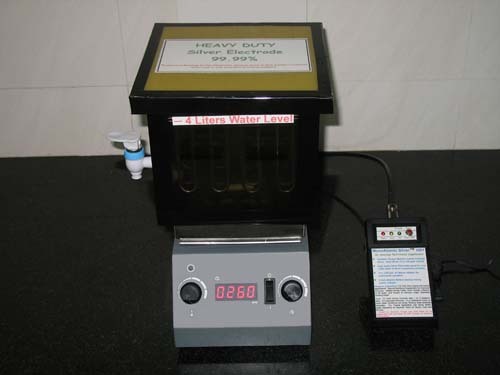 · Heavy Duty Silver Electrode can make up to 1/2 gallon (2 liters) of 3 to 10 ppm Coloidal Silver solution every 3 to 5 minutes. · Good for Doctors, Clinics, Hospitals & Pharma companies. · Add colloidal silver to the final rinse of your washer to give your clothes the goodness of Silver Protection. Silver Gel Electrode can make up to 2 oz. (60 grams) of Silver Gel every 3 minutes. Silver Gel is good for burns, cuts, bruises and insect bites. A small amount of Silver Gel can be used to disinfect the hands by rubbing them together. This helps to prevent the spread of infections. This is eco-friendly compared to the use of Disinfecting Wipes. 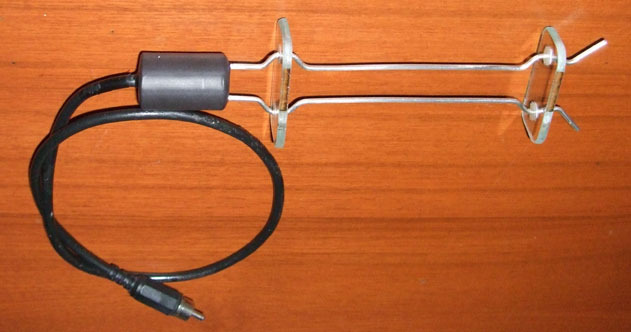 Heavy Duty Silver Generator can produce 10 to 100 ppm concentration at 1.0 to 100 Liters per hour. Good for Doctors, Clinics, Hospitals, Pharma and Biocide industries. Useful as a Biocide for the treatment of Tropical Race 4 (TR4) Fungual infection which threatens to destroy banana crops worldwide. Also good for all types of viral, fungal and bacterial infections in plants. Resistive strains do not develop. We are a non-profit research organization, and should you decide to invest in one of our generators, the funds will go towards further research for the benefit of mankind. 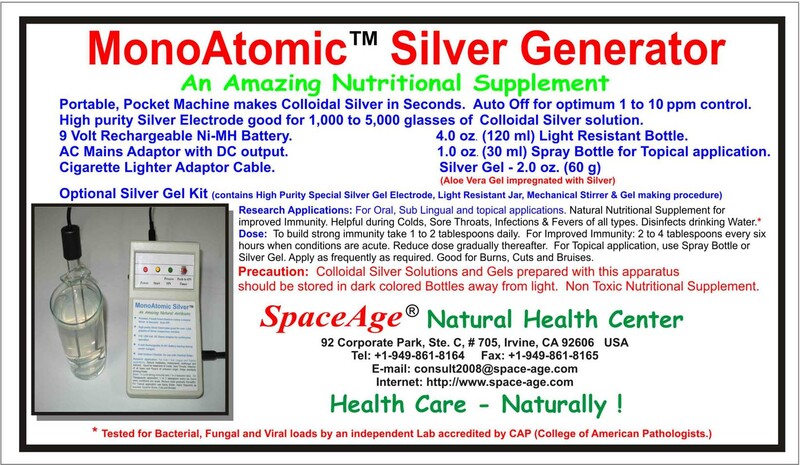 Our line of professionally designed colloidal / nano silver generators have been passionately developed over the last two decades of extensive research and supporting case studies. So please do help spread the word around. A valuable addition to your First Aid Kit. 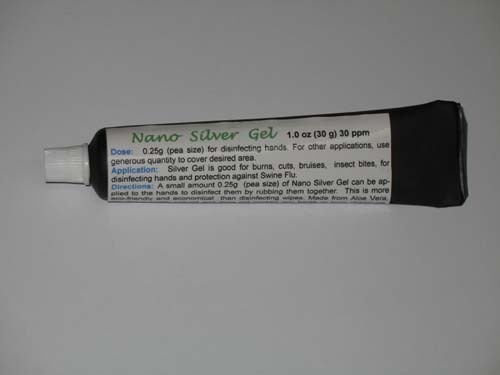 Nano Silver Gel is good for burns, cuts, bruises and insect bites. A small amount of Nano Silver Gel can be applied to the hands to disinfect them by rubbing them together. This is more eco-friendly and economical than disinfecting wipes. Made from Aloe Vera, the Gel is totally natural, and does not contain any harsh or toxic chemicals. Good for softer and smoother hands. A small quantity of Nano Silver Gel when applied inside each nostril, with tip of the little finger, is known to help protect against H1N1 Swine Flu Virus. Form: 1.0 oz. (30 gram) tube - typically good for two months per person. Highly recommend for those not desiring to expose themselves to Flu Vaccines. Gel has nano silver stem cell activators to help remove the most difficult Pigmentation spots on your skin and as well as chronic Melasma. Made from Aloe Vera, the Gel is totally natural, and does not contain any harsh or toxic chemicals. Good for softer and smoother skin. Helps lighten complexion by a few noticeable shades. Main Ingredients: Aloe Vera Gel, Nano Silver 30 ppm. Dosage: Apply liberally to cover he desired area morning and at bedtime after bath. Leave on overnight for best results . Form: 2.0 oz. 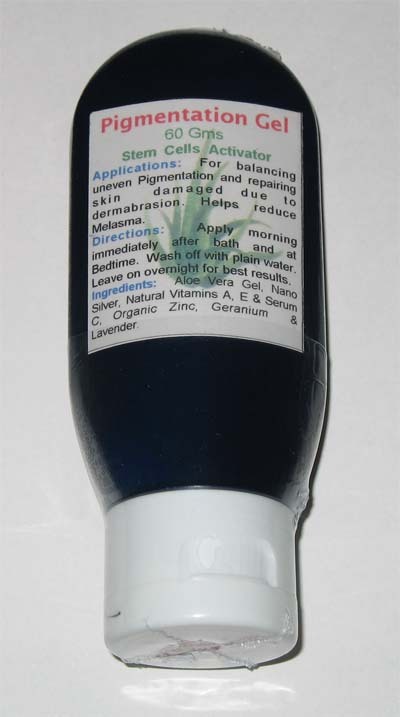 (60 gram) tube - typically good for two months supply. Highly recommend for those with chronic Pigmentation spots and Melasma. ©1995-2015 SpaceAge Concepts (India) Ltd. All Rights Reserved.